This Quartz article by Akshat Rathi featuring comments from “The technoptimist doctor” Bob Wachter, a physician and professor of medicine at the University of California San Francisco and author of The Digital Doctor, highlights some common misconceptions that I thought might be worth attempting to dispel. Perhaps commentators just don’t realise software is used the world over to coordinate emergency services and train the next generation of Doctors? If you’re undecided spend some time trying to imagine how healthcare services would operate if everyone didn’t have connectivity in their pockets. If that fails try and forfeit your mobile and internet use for a week and see how your attitude changes (if you’re a Doctor thinking about doing this check with your medicolegal insurer first!). This isn’t always the case eg. for Patients who are very wealthy and have expensive private insurance, NHS Patients who have smart switched on caring GPs and Surgeons or anyone who can afford £35 out of their own pocket. Malcolm Gladwell has brilliantly explained how in the cause of efficiency the sickcare industry has disrupted the very thing the Patient really wants. Perhaps it’s the obsessive focus on providing ‘FaceTime with a Doctor’ that precludes a lot of healthcare professionals from appreciating the advances technology has brought to medicine. To have any hope of appreciating the opportunity for tech to help improve healthcare we need to stop thinking that the product we choose to produce is the office visit. The use of apps by Diabetics can be very confusing but clinicians need to be on top of this as many Patients already see their mobile as an intrinsic part of their care and Carers are increasingly prepared to hack the healthcare services that they’re being prescribed because they realise that they’re hopelessly out dated. Spot on. I’ve felt that just 10% of IT budgets should go on the IT tech (software and hardware) and 90% should be spent on training & development and this is one of the big factors that is behind why mHealth is so transformational eg. we can radically shift spend when staff can leverage devices that they already own and know how to use. I think it’s important to appreciate that the hospital wasn’t using software that was anywhere near “state-of-the-art”. 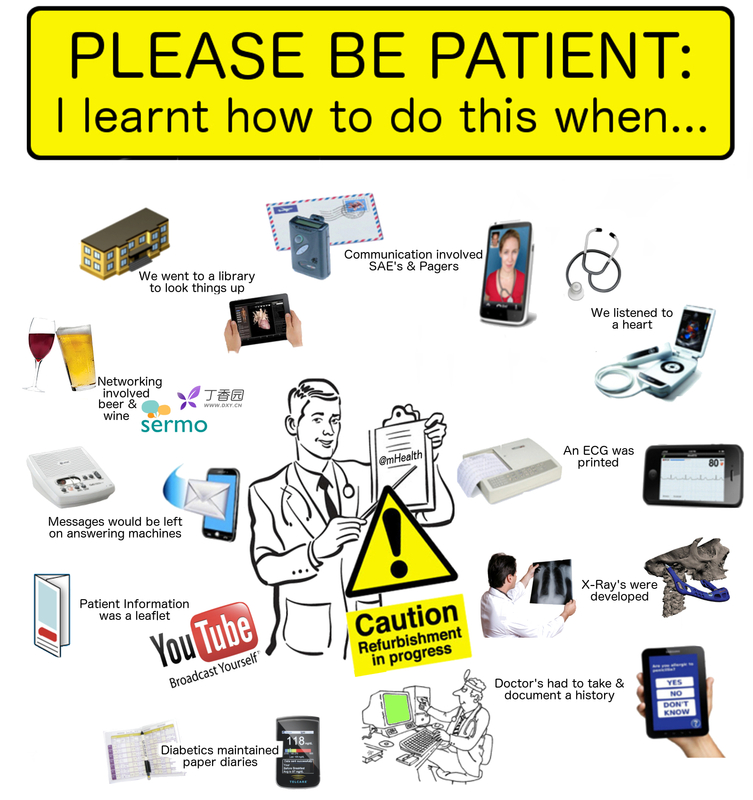 Most US Hospital software is designed primarily to enable the billing of transactions and the Clinician/Patient interaction piece is just an afterthought that is sold via dinner/beer buying sales teams to Doctors who typically have no relevant IT training or capacity to evaluate technology. If you doubt that these software design priorities are in place ask yourself this one simple question: do you think the Hospital software failed to bill for the 39 fold dose of antibiotic that was being delivered to this unfortunate Patient? This makes a really good point about the importance of expectations and the impact that end user rating systems have on driving software quality. It’s key that we appreciate that the reason that new app you downloaded is going to work is because before you downloaded it you could see it’s description together with how others rated it’s use and because there is a mechanism for you to publicly share feedback on your experience. These have important knock on effects because firstly you probably won’t even consider downloading an app that is rated as useless/a waste of time and it also ensures that if you uncover things the app developer/brand can get direct feedback and the advice on how to rectify the issue(s). > the vast majority of Doctors in Ireland use free* (* read advertiser funded Gmail/Hotmail/yahoo/etc) email accounts to send and receive clinical Patient information in preference to the Health Service Executive funded Healthmail.ie service even though the government provisioned service provides security/privacy assurances and there are data protection act directives that users of the ‘free’ accounts are being told they are in breach of. > Practically all implanted cardiac devices in Ireland are sold without connected services even though many manufacturers offer Clinicians/Hospitals comprehensive tech solutions that could support this. Meanwhile the same Cardiologists who are declining to opt for these connected services are prescribing Alivecor ECG cases to Patients who have smartphones so that they can provide a more user friendly DIY style alternative that drives Patient participation. > Most glucometers in use by diabetics in Ireland have never had the data they collect downloaded and while most Endocrinologists are encouraging Patients to go on app stores and use apps the standard practice for review of Blood Glucose levels remains the same as it was pre-smartphones eg. fanning your face with a Patients paper diary. This is a common misconception about NHS Hospitals. Theoretically and practically we can see they have self interests that have prevented them from choosing uniformity. Expecting Hospitals to want to keep care as inexpensive as possible maybe exists in a fairytale but in reality it’s a lot more complex and NHS Hospitals spend fortunes on expensive recruitment agencies (wages make up a huge chunk of hospital budgets), don’t have national contracts for procurement, etc, etc. Many people think I’m in the know and to me this doesn’t explain the failure. It wasn’t that they misunderstood the complexity it was that they failed to include Patients, evidence can be found for this from the NPfIT focus on Hospitals instead of Primary Care (the GP/Patient level is where the biggest communication challenge s exist). The runaway adoption success of KPs service that prioritised providing the Clinician engagement that Patients wanted should provide proof that this was the case. This is an outlook that I see so many Hospitals suffering from because they haven’t prioritised IT and they lack the vision and desire to collaborate. I continue to be amazed that so many Healthcare IT initiatives are led by well paid professionals who think that Healthcare IT training is little more than ‘selling’ something to technophobes. I’ve seen this happening before in a lecture and the conclusion I came to was very different: the best teachers may make it look easy but a much greater level of understanding is required to be able to properly teach something than most appreciate. The Doctors I saw were annoyed because they weren’t inspired enough to even begin to appreciate the difficulties faced by the aviation industry and they probably realised the salesman delivering the thinly veiled pitch had little/no idea about the complexity of the challenges that aviation or medicine faced/faces. If you get someone who understands the complexity of aviation and medicine – smart Doctors I know of who also have piloting experience would include Dr Richard Sills, Dr Daniel Kraft or Dr Chris Bickford – the educational opportunity is golden. What thoughts did you have on reading the article? Excellent review of some of the major issues for patient care, EHR documentation vs usability and how medical safety and aviation safety are two very different issues. There should be much more evaluation of how the two relate. But the concept of medical encounters being documented in the background without having to use a keyboard are very valuable and that will be the ultimate solution to many of the patient safety issues. Chris Bickford MD/aspiring pilot/RC pilot.